ARROWSMITH -Chart of the Pacific Ocean. ARROWSMITH, A. - Chart of the Pacific Ocean. Chart of the Pacific Ocean. - ARROWSMITH, A. Title : Chart of the Pacific Ocean..
Map maker : ARROWSMITH, A.. Size : 9.6 x 14.4 inches. / 24.5 x 36.6 cm. Description :Very interesting map of the Pacific Ocean. Shows the tracks and dates of Captain Cook's voyages! (and also Clarke and Furneaux). Shows Australia with unfinished coast lines, partial Tasmania and New Guinea, strangely shaped Alaska and North-West coast of America (New Albion), the Sandwich Isles (Hawaii) - where Cook was killed,... Very detailed map, naming many small islands in the Pacific Ocean! 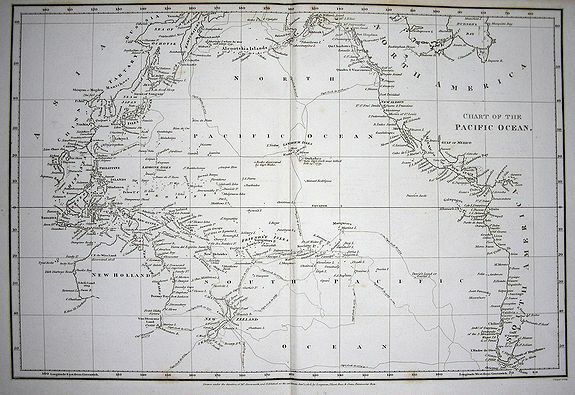 An important early example of early 19th century mapping of Australia and the Pacific! Condition : Excellend dark and clear impression. Some faint toning and spotting. Yellowing to top margin. Very good condition.